I love pink. Well I love a lot of colours but pink is one of those. 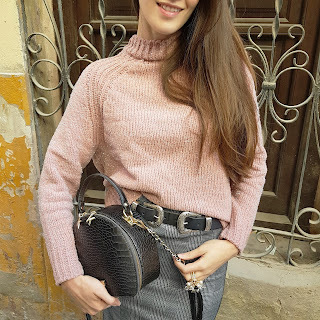 I find it a very sweet and feminine one and I feel very comfortable with it and I think grey is also like pink so combining both is something I often do. This grey long skirt from Shein is perfect for this. I like a lot combining the long length skirt with a cosy sweater and if is in this two colours even better. To break a bit the sweet style...a pair of high heels and all the accessories in black of course.